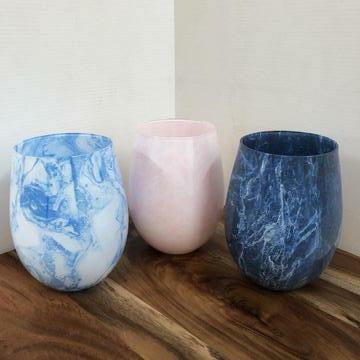 Fun and lively stemless jar that comes in different marbled colours and patterns! 11cm high and 8.5cm wide. This jar holds 500g wax. We recommend using a CDN 20 wick with this jar. Quantities can be updated in shopping cart. Buy 12 and get 10% off.